Dr. Lessard’s research focuses in two areas: program evaluation and early childhood obesity prevention. She serves as the Director of Evaluation for Delaware INBRE (www.de-inbre.org) where she coordinates evaluation activities statewide. She is also involved in program evaluations in a wide range of topical areas including clinical practice changes, community based health promotion programming and innovative strategies to address the impacts of medical debt. In the area of childhood obesity prevention, she is especially interested in how child care environments can support healthy eating and and physical activity among young children. She has conducted multiple studies examining the implementation and enforcement of policy interventions in these areas. 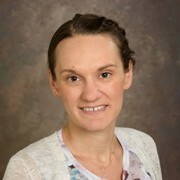 Dr. Lessard has training in Public Health (MPH in Epidemiology and Biostatistics from Tufts University and PhD in Behavioral Sciences and Health Education from Emory University) and serves as Director of the Public Health Minor in BHAN. Hallam RA, Bargreen K, Fouts HN, Lessard L, Skrobot C. (2018). The Use of Infant Confinement Equipment in Community-Based Child Care Centers: An Analysis of Centers Participating in a Statewide Quality Rating and Improvement System. Maternal and child health journal. 22(5):694-701. Lessard LM, Solomon J. (2017). Effects of a Patient-Friendly Medical Debt Financing Program on Access to Care and Social Outcomes. Journal of Health Care Finance, Fall 2017; 44(2). Lessard L, Solomon J. (2016) Demographic and service-use profiles of individuals using the CarePayment program for hospital-related medical debt: results from a nationwide survey of guarantors. BMC Health Services Research, 16:264. Solomon J, Lessard L. (2016). CarePayment program hospital outcomes: Results from semi-structured interviews with hospital staff. Journal of Health Care Finance, Spring 2016, 42(4). Morin K, Small L, Spatz DL, Solomon J, Lessard L, Leng SW. (2015). Preparing leaders in maternal-child health nursing. Journal of obstetric, gynecologic, and neonatal nursing: JOGNN. 2015; 44(5):633-43. Lessard L, Breck A. (2015). Childhood Obesity Prevention in Childcare Settings: the Potential of Policy and Environmental Change Interventions. Current Obesity Reports, 4(2):191-7.